Sen. John McCain (R-Ariz.) lambasted Donald Trump on Sunday, saying the President’s remarks on soon withdrawing U.S. troops from Syria “emboldened” the country’s leader Bashar al-Assad to order an alleged chemical weapons assault. The Republican from Arizona, a war veteran who serves as chairman of the Senate Armed Services Committee, has been one of Trump’s most fierce critics among GOP officials since the president took office. McCain’s released his statement just hours after a Trump tweet that warned there would be a “big price to pay” for an alleged chemical weapons attack in Syria. The president blamed Russian leader Vladimir Putin’s support of the Syrian regime led by Assad. Trump also slammed his predecessor Barack Obama’s policy decisions in the war-ravaged country. On Saturday, Syrian activist organizations stated toxic gas inside barrel bombs launched from helicopters over Douma, a suburb of Damascus, left scores of civilians dead and many more injured. Last year, McCain — a prisoner of war whom Trump once controversially said was “not a war hero” — approved of Trump’s decision to order a missile strike on an airfield in Syria as a response to a previous alleged chemical attack. The Senator urged the President to take a similar course of action this year. 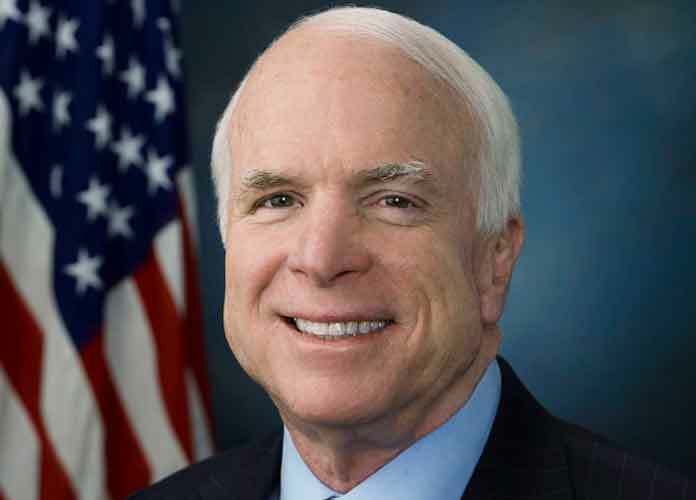 “He should do so again, and demonstrate that Assad will pay a price for his war crimes,” McCain added in his statement. Nikki Haley, the U.S. Ambassador to the United Nations, stated Sunday that the United States and eight other nations demanded an emergency U.N. Security Council meeting Monday to talk about the crisis. Multiple legislators responded Sunday to the alleged chemical weapons strike launched by Assad, as well as to Trump’s tweets. The chemical attack in Syria is a horror that cannot be tolerated by responsible nations. The U.S. must continue to lead an international effort to hold the Assad regime and Russia accountable for their actions. Sen. Chris Murphy (D-Conn.) called Ryan’s words “empty” and urged Congress to utilize its power to authorize greater military responses when it comes to foreign policy. The chemical attacks ARE horrible. But if you support military action, then Congress needs to authorize it. Just continuing tacit congressional support for existing policy – more unauthorized troops but zero diplomatic or humanitarian strategy – is part of the problem. Nancy Pelosi, the House Minority Leader, said in a statement that if confirmed, the chemical attack “would be a war crime of staggering inhumanity.” Pelosi also said “a thorough investigation” was vital. Sen. Lindsey Graham — who like McCain is one of the Republican Party’s top supporters of greater U.S. involvement in Syria — pushed for an increase in sanctions against Assad.